Large storage containers in San Francisco can be useful for many different applications. They could be the right temporary solution for keeping construction tools at a job site, without the complication of lugging supplies from your yard to the work site. Or they could be a more long term solution to storage needs at a government facility, holding office furniture, files that need to be saved for an extended period of time, and equipment that is only used intermittently. Our containers are versatile and can be used for a variety of applications. While these are suggestions, they are certainly not the limit of what our storage containers can do for you! If you have any storage needs, we can help. Haulaway understands that businesses and organizations move fast. 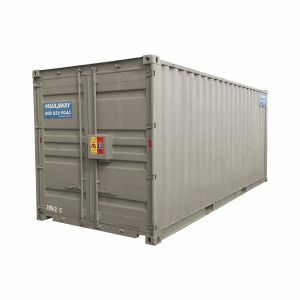 When you need large storage containers in San Francisco, you need them now. That’s why we deliver to many areas within the next business day. Instead of wasting time renting an offsite storage unit and transporting goods back and forth, rely on our convenient, secure, and weather-resistant industrial storage containers that can be delivered directly to you. The convenience of on-site storage coupled with our storage containers’ reasonable prices are advantages that make Haulaway the best in storage solutions. Wherever you need large storage containers in San Francisco, from the Presidio to the Mission, Haulaway is your partner in storage solutions. We offer a variety of large scale containers: roll-off containers with double doors on each end in 21’ and 26’ options, cargo containers in 20’ and 40’, and we offer custom containers to suit your needs. For residential storage, our 10’ container is ideal and can fit in many backyards and driveways. Contact Haulaway to discuss the possibilities.